There are a number of ways a fossil forms, depending on the type of remains and the environment present. In general, the process for most fossils is much the same: the hard parts of animals, such as bones, teeth, and shells, as well as the seeds or woody parts of plants, are covered by sediment, such as sand or mud. Over millions of years, more and more layers of sediment accumulate, burying these remains deep within the earth. The sediment eventually turns to stone, and often the remains are chemically altered by mineralization, becoming a form of stone themselves (these are the type of fossils often viewed as the recreated dinosaur skeletons seen in many museums). The same process also produces petrified wood, coprolites (petrified excrement), molds, casts, imprints, and trace fossils. Most fossils are found in sedimentary rocks—those rocks produced by the accumulation of sediment such as sand or mud. Wind and other weathering conditions wash away sediment on land, depositing it in bodies of water. For this reason, fossils of sea creatures are more common than those of land creatures. Land animals and plants that have been preserved are found mostly in sediment of calm lakes, rivers, and estuaries. A fossil may also consist of unaltered original material. Bones and teeth are commonly preserved in this way. However, far more often the pores of bone and teeth are filled with minerals in a process called permineralization (what many have called petrifying). Circulating ground water carries silica or calcium carbonate (and sometimes other minerals, such as pyrite) that fill the pores. What remains is, in essence, a duplicate of the original bone or other organic material. 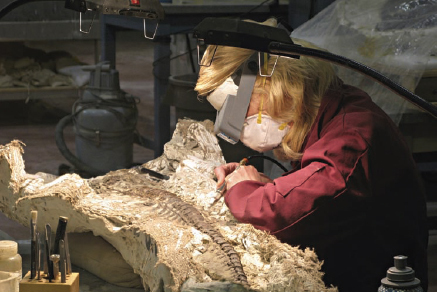 Uncovering a fossil from the surrounding rock is meticulous work that can take hundreds of hours because paleontologists do not wish to damage an artifact that took millions of years to form (iStock).